Oh, I know, I know. They’re so damn cute. They’re a symbol of Austin. Countless generations of Austinites have been conceived under the Congress Street Bridge during dubious ‘bat-watching’ dates. 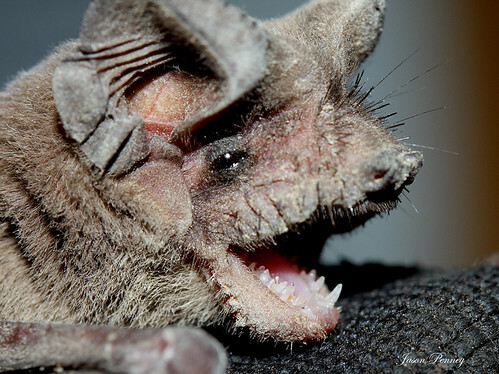 But I have to ask: how much do you really know about the common Mexican Free-tailed Bat? By which I mean, how sure are you that they aren’t a really fiendish horde of blood-sucking demons who leave the Congress Street Bridge by night to feast upon the living? Oh, I know. You think they live on mosquitos. But look at those teeth and tell me those are for bugs. You ever kill a mosquito? Know how they squish real easy ’cause they don’t have any bones? So tell me: if you’re living off flying invertebrates, why would you need teeth like that? The answer, of course, is that you don’t. I’ll tell you what’s happened here. With their big ears and whiskers and scrunched-up little cat faces, the bats have tricked us into thinking they’re harmless. Instead of being terrified by the possibly demonic presence just blocks from the Capitol, we’ve made them our city’s unofficial mascot. We’re in mortal danger, folks, of waking up one morning to find the bats in control and ourselves as their undead minions. But it’s not too late. We can still take back our city. I’m not, of course, advising violence against bats. I think that, for all their possible evil, they’re still pretty cute. We need more of that in this city. Also, I’m not certain they can be killed. So instead, I present you with the top-eight list of things we can do to help avert the Bat-ocalypse. Ban The Bat City Review. A literary magazine telling the bats that the city is already theirs? Seriously, whose side are you guys on? It’s only by the grace of God that bats prefer pulps and cheap gothic romance, or else they would have caught on to this by now. Knock it off. Stop going to the Congress Street Bridge on dates. The risk of vampiric bat infection is just too high. Even if you don’t mind waking up to your significant other sucking the life-fluids from your neck, what if he or she cheats on you? Don’t put the rest of us at risk. Spend some of Will Wynn’s leftover campaign money on an ad-campaign linking the bats to terrorists. Personally, I’d suggest the Zapatistas-no one’s ever seen their Subcomandante Marcos without his ski mask. Could he, in fact, be a bat? Seems suspicious to me. Every night at sundown, burn a hipster at the stake under the Congress Street Bridge as a warning to the creatures of the night. True, true, I don’t know this one will work. But dammit, in a time like this, aren’t you willing to take the chance? A UT/ACC joint ‘Defense Against the Dark Arts’ class. Personally, I’m a little surprised that this hasn’t happened yet. Might create more interest for the struggling UT Affiliated Studies program in Transylvania. Stop advertising for them. This means you. And you. One of these days they’re going to get internet access down there, and they’re going to realize how harmless we think they are. And then it’ll all be over. That’s a start. But we need more. Our clustermap shows we have visits from France, South Africa and Australia, to name a few. Obviously, I attribute this universal appeal to the bat post. Also, I might add that they can be disappointing. I went down to the Congress bridge a few weeks ago, and there was nothing. I know, I know–it’s not there season. But I had visitors in town, and they wanted to see them. To put it mildly, it was the most embarrassing moment in my life. I didn’t leave the house for days. Feels good to get this off my chest. I agree with #5, but think you may want to up the number to 2-3 hipsters. Why not get rid of as many as you can at a time? There is certainly no shortage.